These days, almost everyone is watching video on digital devices. Not only young people watch their favorite videos on tablets and smart phones, increasing parents also tend to store the cartoon movies on portable devices for their children. However, here come 2 issues: the video you have can’t be played on your digital devices and storing videos/films on those devices can take up much ROM space. It can be annoying if any of these problems happen to you when you’re eager to watch videos on smart phones or tablets. So I’d love to show you an easy way to solve those issues perfectly. WonderFox HD Video Converter Factory Pro is a powerful and user-friendly software to help people convert video format, and reduce video file size while keeping the original quality. It allows you to convert video to 300+ digital formats and devices, the great feature of it is it works smoothly in converting high-definition video. It’s able to convert video to 4K video. Besides, it can also be regarded as an online video downloader. It can download video from various websites with fast speed. Here’s more detailed information about the excellent software. WonderFox HD Video Converter Factory Pro is designed with numerous options of digital video/audio formats and devices. With a user-friendly interface, it allows everyone to handle it within few minutes. All you need to do is following the instructions. First, click on “Add Files” to add the video/audio file that needs to be converted. Then choose the output format that you want. When it comes to output video/audio formats, WonderFox HD Video Converter Factory Pro will never disappoint you with 300+ formats and devices. For people who’d love to enjoy video on their TVs, let’s take Samsung TV as an example, Samsung TV claims to support MKV format. So all you need to is converting the video format to MKV, then play the converted MKV on Samsung TV. The whole process is easy enough for everyone to handle. WonderFox HD Video Converter Factory Pro can also be regarded as an online video downloader. It’s able to download video from various websites, such as YouTube, Vimeo, MetaCafe, Facebook and more. The downloading process is easy and you can feel free to choose the format of the downloaded video. 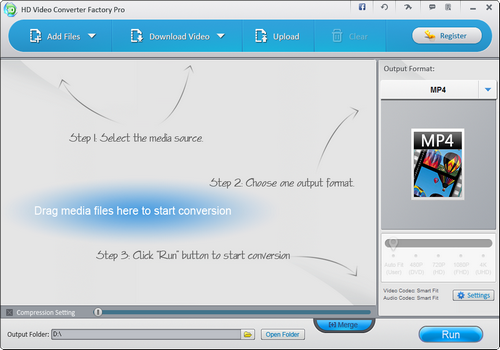 WonderFox HD Video Converter Factory Pro allows you to edit the settings of the output video as you need. For example, if you’re converting a movie to MP4 which isn’t equipped with your native language, with WonderFox HD Video Converter Factory Pro, you can add subtitles to MP4 easily. Very informative post I actually need this type of post to post some videos on my website.